1. Preheat the oven to 200°C, gas mark 6. Place a flat baking sheet inside. 2. Place the apples and all but 1 tbsp of the sugar in a saucepan with a lid and simmer gently until pulpy (about 10 minutes). Remove from the heat and leave to cool until completely cold. 3. Place the flour and cinnamon in the bowl of a food processor and pulse together with the butter, add the egg yolk and milk and continue to pulse until it comes together as a ball. Tip out of the bowl and chill, covered in clingfilm in the fridge, for at least 30 minutes. 4. Divide the pastry into ⅔ and a ⅓, and use the larger piece to line a 23cm round loose bottom tart tin. Don’t worry if the pastry cracks, just patch it up, it will rise in the oven. Spread the base with apricot jam, scatter over the almonds then top with the cooled, cooked apple. 5. Roll out the final piece of pastry, and use to top the pie, folding over the edges well. Add 2 slits to the top of the pie, before brushing with the beaten egg white and sprinkling with the reserved caster sugar. 6. Bake in the preheated oven on the hot baking sheet for 30-35 minutes until golden. 7. 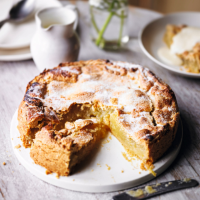 Serve the pie warm with Waitrose Seriously Creamy Madagascan Vanilla Custard. This recipe was first published in Fri Mar 13 12:30:00 GMT 2015.